Ever growing requirements and long-time experience in the cable and wire technology allow us to provide the optimal solution for many different industrial sectors. Fields of applications can be found in the automotive industry, in traffic engineering, in the aviation industry and in mechanical engineering. Experience, combined with innovation, guarantees superior quality for new products. 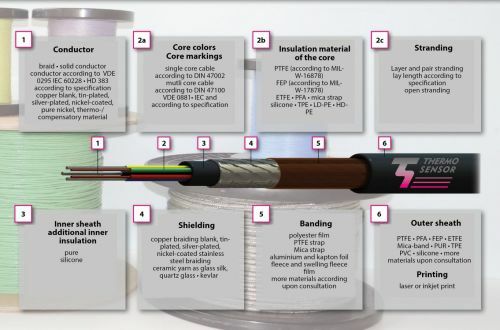 The wide range of products includes thermocouple and extension wires, heat-resistant cables up to 1,565°C, coaxial and hybrid cables, sensor wires and single wires or multi-conductor and/or screened cables. Connection cables are a connection between the measuring instrument and the temperature sensor. The maximum operating temperature is determined by the insulation material. Depending on the application we can provide you with the optimal combination of insulation material, core cross section, shielding and cable sheath. The inner conductors of thermocouple wires consist of original thermocouple material. A huge selection is available from stock and enables us to supply our customers on short notice and without minimum order quantities.